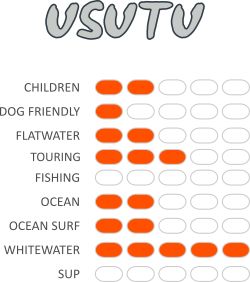 To get older children and teens into whitewater kayaking, the Usutu is your best choice. They can develop skills and confidence without fear of being stuck in a kayak; if they fall off, they can climb back on. The Usutu is too big in size for smaller children. 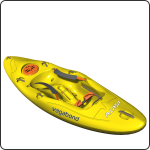 For them, go with our children’s kayak, the Kwando, which can easily handle rivers with small rapids. As rivers are not all rapids – there are always flatwater sections. The Usutu tracks beautifully and moves swiftly to get you through open stretches. For multi-day whitewater trips where there are lots of rapids and not too many miles of flatwater, the Usutu is a great kayak. It is easy to pack your stuff in the stern of the kayak, which has huge volume and lots of space. It is important to keep the weight as close as possible to the centre of the boat. It is advisable to clip your drybags to the rope loops underneath the hatch. Nope, this whitewater kayak is not designed for fishing. Like you, the Usutu enjoys beach holidays. But the Usutu is definitely more at home on rivers. Designed to be able to surf in rapids, the Usutu can certainly handle surfing waves at the beach. If you plan to spend more time at the coast, get our Dumbi kayak instead. It is on rivers and in rapids that the Usutu is most at home. For beginners, Usutu allows you to play and learn as you develop whitewater skills and confidence. If you fall off, just climb back on. For experienced paddlers, you’ll enjoy the freedom of this sit-on-top and the opportunities it opens to test and stretch your skills without worrying about taking a swim. If you have a solid roll, you’ll be able to roll the Usutu.